Los Home Phonema son tan majos que a la que te descuidas te montan un concierto gratis en tu piscina, en este caso en la piscina de Mario. Tras la obligatoria barbacoa acompañada con cerveza descargan la furgoneta y montan su carpa particular. ¿Quién podría dejar pasar la oportunidad de verlos en directo en remojo y sujetando un espirituoso? 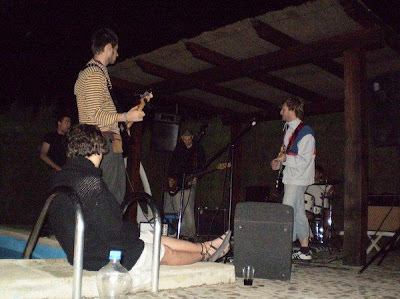 The Home Phonema are so benevolent that when your attention to the group strays for just one moment they set up a concert at your pool for free. This time it was at Mario's place. After the “always a must” backyard barbecue and a couple beers, The Home Phonema unloaded their van and set their own tent for the show. Who could pass up the chance of seeing them while wading chest deep in water and holding their favorite alcoholic beverage?